President Donald Trump and his alt-right advisor Stephen Bannon—“President Bannon” as he is being called—are making enemies fast, and lots of them. Leaders of some of the country’s largest corporations have come out against Trump’s Muslim and refugee ban. Some Christians, including Evangelicals, object to the ban’s privileging of Christians. Trump’s statement on the holocaust, which failed to mention Jews, offended major Jewish groups. Workers, workers’ centers, and labor unions, which represent many immigrants, have also spoken out against the Muslim ban. These controversies and conflicts, especially the major capitalists who are breaking with Trump on this issue, are very significant. The problems that Trump faces are a reflection of conflicts among elites over the U.S. role in the global economy. American corporations have become globalized in a variety of ways. First, they have operations around the world that involve deploying executives and other employees to many different countries for long term stays or short visits. Consequently, restrictions on travel represent a serious problem for such companies. 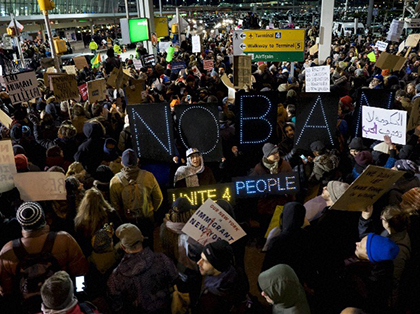 Thousands demonstrated at airports across the country, including New York’s JFK airport. Second, the massive global migrations of the last 40 years have provided many corporations with immigrant employees from virtually every nation on earth, employees who are executives, technicians, and workers. These may be people on their way to citizenship, Green Card workers with permanent residency, workers on specific visas, or undocumented workers. Restrictions on employees in all of these categories also represent a threat to modern multinational corporations. Most important, modern corporations operate with global production chains, with parts made in one country, products assembled in another, and then perhaps sold in yet another. Trump’s policies threaten to throw a monkey wrench into the machinery of world production both by inhibiting international population movements and by altering agreements like NAFTA that allow for the free expansion of supply chains across borders. Trump’s white nationalist economic and political program appears to want to rip the United States out of these complicated relationships, and that will be bad for many businesses, which is one of the sources of this initial friction between the administration and the corporate world. Trump is also, of course, trying to influence corporate decisions about where to invest and where to build new plants, demanding that manufacturing jobs remain in or return to the United States. From the point of view of corporate boards, this is an intrusion into their business and their right to make a profit. Yet, at the same time, he is promising to reduce government regulation of all sorts—including labor and the environment—and to cut taxes. Business of course loves these concessions, and they will likely limit outright opposition to the administration, at least as long as there are still doubts about how far Trump’s nationalist and protectionist program will be taken. Yet, the present controversies and conflicts are not only about the material issues of the business world. The “white” part of the white nationalist program makes categroical opponents of Muslims and Jews, as well as Asians, Latinos and, of course, Blacks. Trump’s and Bannon’s white nationalist ideology also represents a profound break with American’s historic ruling class ideology of democracy, pluralism, and more recently of diversity and inclusion. The ideological rupture that is taking place, exacerbated by Trump, also represents a major development that gives rise to splits from the top to the bottom of American society. While the United States has a long history of racism and pockets of society that subscribe to rightwing racist ideas, most Americans do not hold the alt-right, white nationalist ideology, and converting many of them to it will take some time. Others, of course, will never accept it. Meanwhile the struggle between traditional liberalism, contemporary neoliberalism, and white nationalism will continue to cause conflict. Schutlz also expressed his support for the Deferred Action for Childhood Arrivals (DACA) program that Trump has vowed to eliminate, and expressed Starbucks’ commitment to hiring refugees. 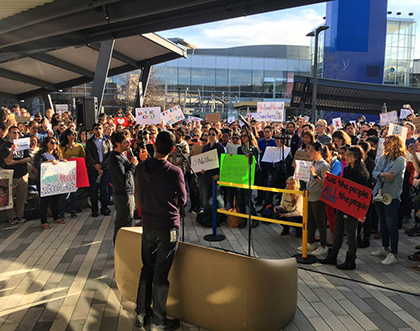 Google employees rally at Google headquarters. Photo by Luis Marco / Twitter. Tech companies went further than others, with Amazon and Expedia joining the State of Washington’s federal lawsuit against the Trump administration because the new policy adversely affects their businesses. While most Republicans have enthusiastically endorsed Trump’s policies since his election, some have remained silent, and a few leading Republican politicians have spoken out against Trump’s executive order. Republican Senators John McCain and Lindsey Graham and some eighteen other Congressmen criticized Trump’s Muslim ban either in principle or for particular aspects of it, such as the detention of Green Card holders, or its crude implementation. Trump’s presidency has already created a variety of fissures in American society and internationally. The resistance movement will be working to exacerbate these until they become deep rifts between Trump and various elements of his political base. Dan La Botz is a member of Solidarity in New York City, and an editor of New Politics.